Cooking with a cast iron skillet can give your food amazing flavor – just like with this Cast Iron Skillet Mahi Mahi. 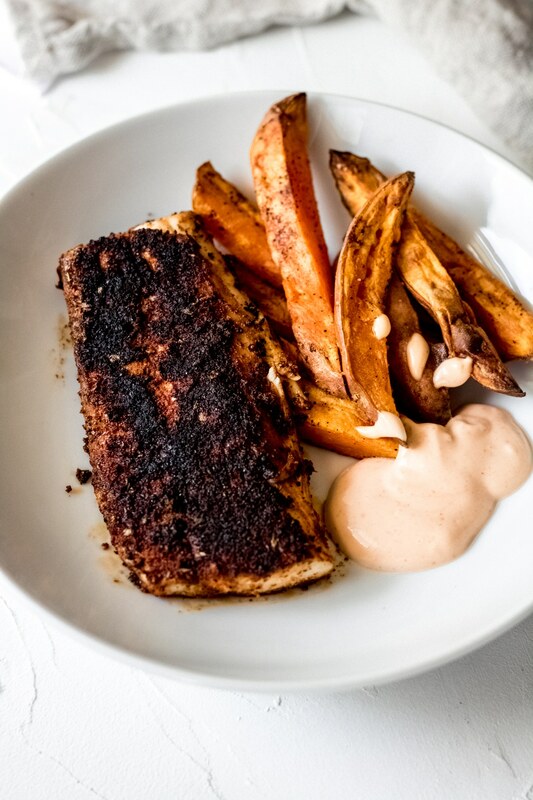 Mahi Mahi is one of our favorite gluten-free dinner options, which you can find all of our Mahi Mahi recipes in one easy to navigate collection! If you don’t cook regularly with your cast iron skillet, hopefully, this recipe will win you over and you’ll test out your cooking skills with a cast iron skillet. They’re great for cooking with high heat and giving the food a deliciously seared crust. 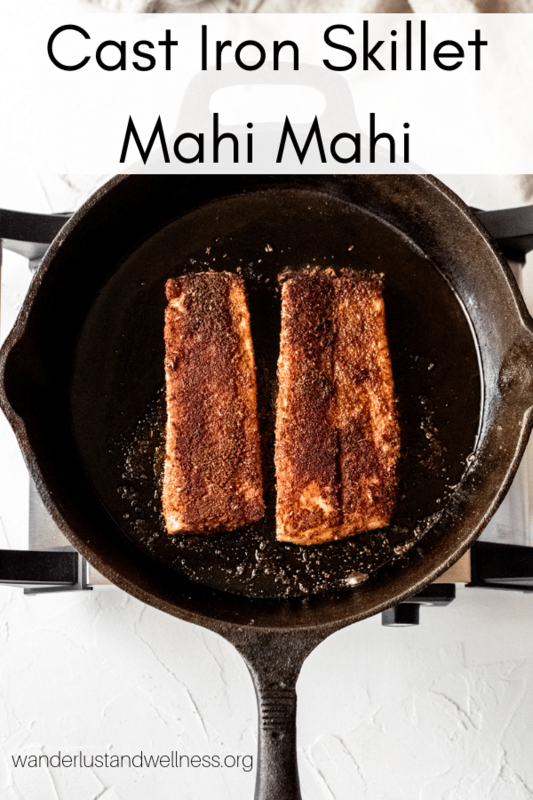 If you caught my recent recipe on how to blacken Mahi Mahi – then you’ll know that cooking with a cast iron skillet is super easy. We love to pan sear steaks, seafood, shrimp, and more in our cast iron skillet. And believe it or not, the clean-up is a sinch! Heat avocado oil over medium-high heat in the cast iron skillet. Add 2-3 tablespoons of avocado oil – we recommend avocado oil – over medium-high heat. Season the Mahi Mahi fillets. Generously season both sides of the Mahi Mahi fillets. 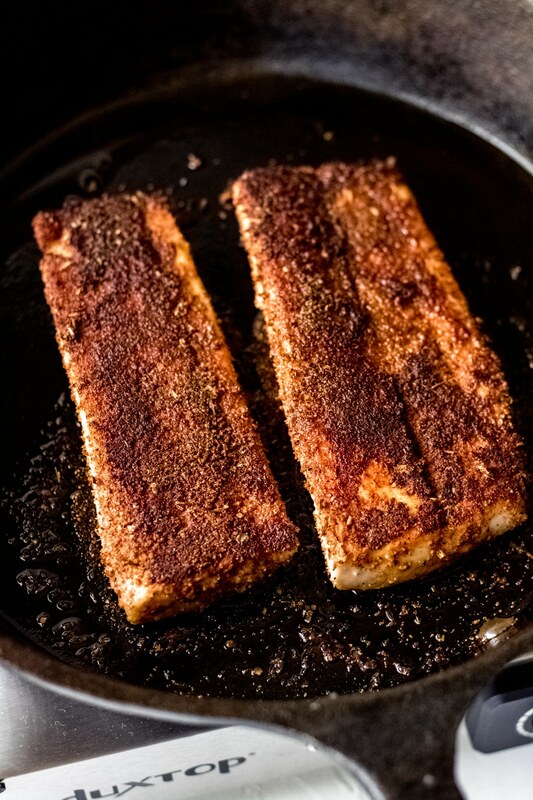 You can blacken the Mahi Mahi using a homemade blackening seasoning, or season with your favorite seafood seasoning. Add the Mahi Mahi fillets to the hot oil. Gently add the Mahi Mahi fillets to the hot oil and cook for four minutes on one side. 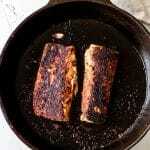 Carefully flip the Mahi Mahi fillets and cook for another four minutes on the other side until done. You can check both the internal temperature and use a fork to pull apart a small part of the fillet to see if it’s white and flaked. The optimal internal temperature for Mahi Mahi is 137 degrees F.
Serve with your favorite side and dipping sauce. Serve your fillets with your favorite gluten-free side dish and dipping sauce! Is cooking with a cast iron skillet bad for you? No, there are no harmful elements from cooking in a cast iron skillet. If anything, you may ingest a small amount of iron by cooking your food in a cast iron skillet. Can you ruin a cast iron skillet? Never use soap with your cast iron skillet, and do not put it in the dishwasher. If you do you will strip the seasoning from the skillet. 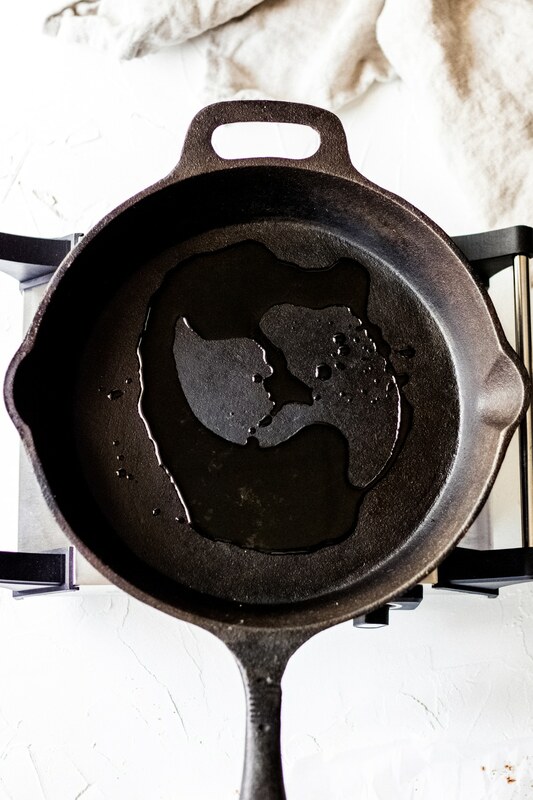 How to you clean and season a cast iron skillet? To initially season your skillet spread a thin layer of avocado oil over the inside of the skillet. Preheat your oven to 375 degrees F. – place yoru skillet in the oven and let bake for 1 hour. Cool before using or storing. 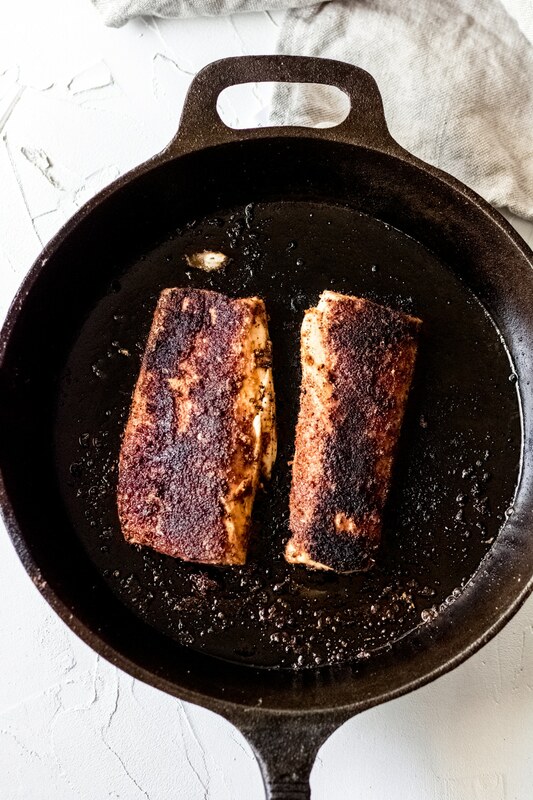 Use your cast iron skillet to get the perfect crust on this cast iron skillet Mahi Mahi – and easy gluten-free dinner option! 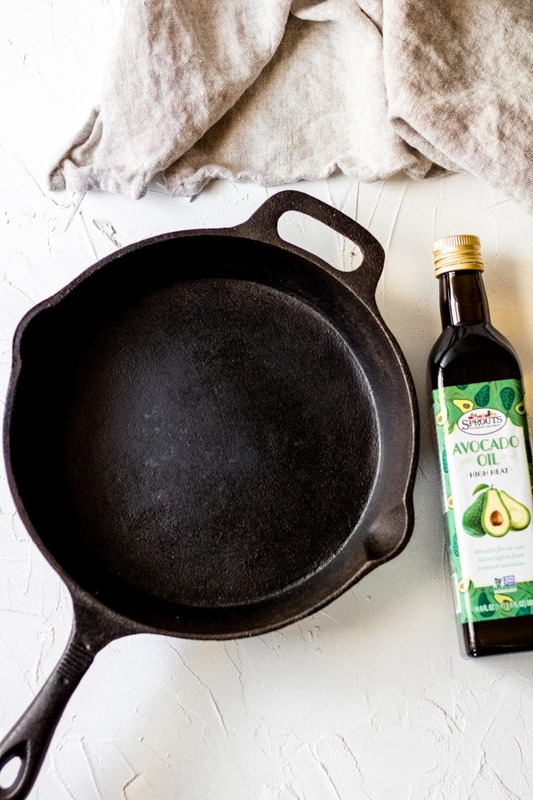 Heat the avocado oil in the cast iron skillet on medium-high heat. 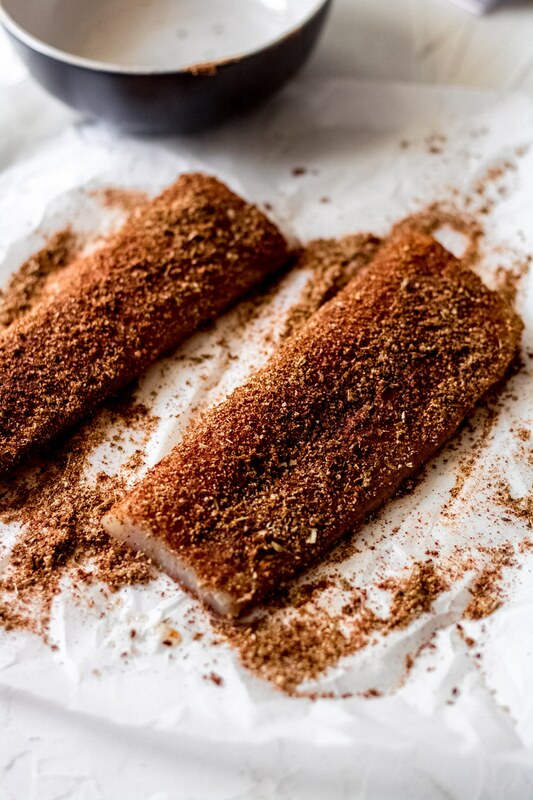 Generously season both sides of the Mahi Mahi fillets with the seafood seasoning. Place the fillets into the hot oil and cook for 4 minutes on one side. Carefully flip the fillets and cook for another 4 minutes on the other side. The fillets will be done when they flake easily and reach an internal temperature of 137 degrees F.
Serve immediately with your favorite side(s) and dipping sauce. Be sure to use fresh or fully thawed Mahi Mahi fillets.